Finance Accounting ERP Software can help your organization transform its finance and accounting operations into a cost-effective, strategic business asset through proven technologies and service options that align with your business needs and support your goals. We provide business accounting software, focused on such functions as accounting, customer relationship management, government management, human resources, fixed asset management, and contact management as well as provide industry-specific applications for customers in fields of construction, distribution, retail, contracting and manufacturing industry. 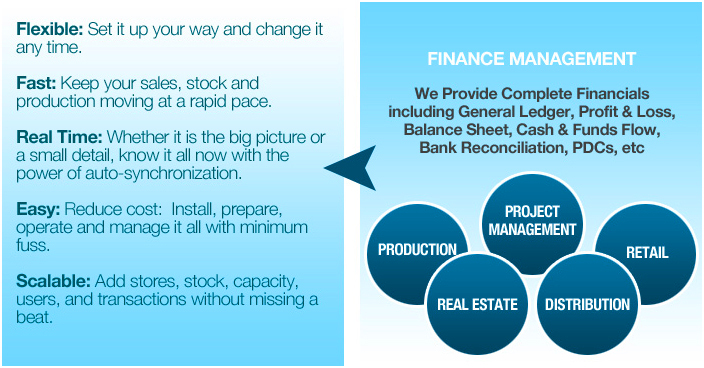 Finance Accounting ERP centralizes all of your organization’s core financial data and enables you to take advantage of global opportunities. The ledger will offer you greater efficiency and drive productivity. Centralized data enables decision makers to make informed decisions that speak clearly from your firm’s financials. Your ledger will maintain data integrity and even streamline financial reporting routines, which are customizable by user. Your firm can operate with greater transparency and less confusion. We help to manage account in an integrated manner. Make accounting easy by preparing chart of accounts that have all major groups like liabilities, loan funds, assets etc. Prepare and manage general ledger, sub ledger and cost center through chart of accounts. Create Accounts Receivable and Accounts Payable (AP) vouchers. Tag date, group name, sub ledger etc. Create sub-ledger by entering details like name, class type associated Permanent Account Number. Create journal to maintain record of business transactions along with ledgers affected by each transaction. Maintain distribution rules for automated revenue and expense allocation.